Hi Randall. License plate looking for a vanity plate that was attached to a Corvette. Howdy, I just picked up my issue of Vette today before I went to a small collector car auction. 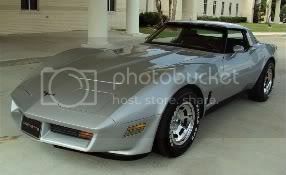 I want to say that your Vette is awesome! If I was to buy a C3 today the 80-82s are my first choice, but I got my hands full with my 90. I hope you enjoy 81! also, I just saw you graduated in 1978 from Redemptorist High.... I went to Redemptorist all my life, but in the last 2 months of school I had to move to Istrouma (long story) but actually went to Redem. for all high school years. Randy- how did you come out with that brake issue? Did you resolve it yet? Also, I was wondering where you got the beautiful cloth seat covers you have. I'm thinking of replacing mine and the cloth ones may be an option. Just checking in w/you. Hope all is well. Mike J.
Randal- It just hit me on the way home about your "BRAKE" light- are you sure the e-brake handle is all the way down? If that handle is slightly off the bottom position, the BRAKE light will illuminate.... I'm sure it must be a dual function light that will alarm for a low fluid level as well, but check the e brake handle before you go into it any further. Nice meeting you tonight. Hope we can get together again, maybe all 4 of us ? I have a swimming pool here if you wanna bring your crew sometime. We can bar-b-q and such. My phone is : 225-910-0059. Also, if you want me to I can get you acquainted with my local group of cruisers, you met 2 tonight (NOT the BR Corvette crew). They were Jay and Steve, we make 1 or 2 cruises a year, they are a fun group. Keep in touch . Mike J. Yes, I will probably be there if nothing big comes up. Look for me in the white on red 1980 model . I will probably get there a little late b/c of the heat, but will look for you as well. Mike J.
Randall, lost the phone number to your body man in Central. Please pm it to me again. Thanks. the 80 model with the new heart transplant is about98% complete, waiting on throttle and TV brackets due in tomorrow.